A vintage mid-century modern brushed chrome and lucite vanity mirror in the style of Charles Hollis Jones, ca. 1970. Very regal and chic, with bold geometric lines. Features a frameless oval mirror held suspended from two brushed chrome arms attached to a thick lucite base. 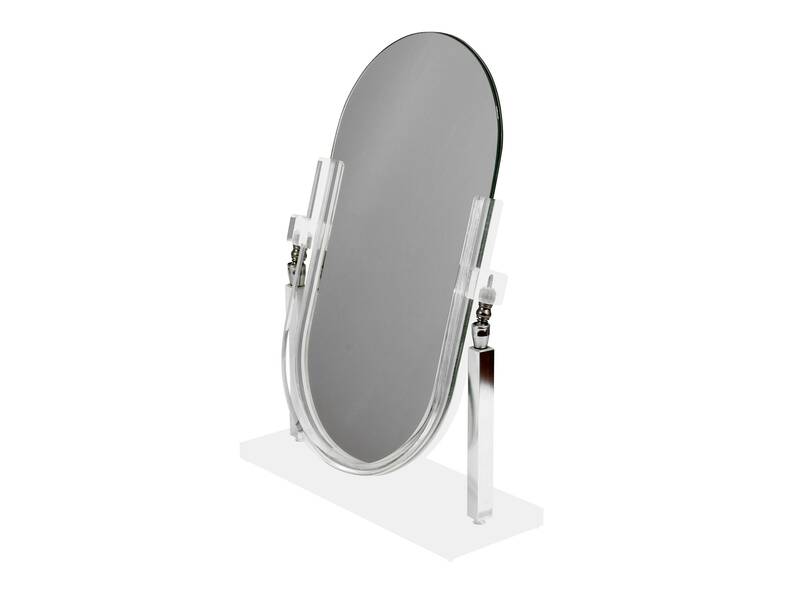 The mirror is two-sided and the hardware allows for an adjustable mirror angle. Great vintage condition. Lucite has very minor scuffing, appropriate with age. The front of the mirror is in wonderful condition, no imperfections. The back of the mirror has a few very small spots in the silvering around the perimeter (shown).